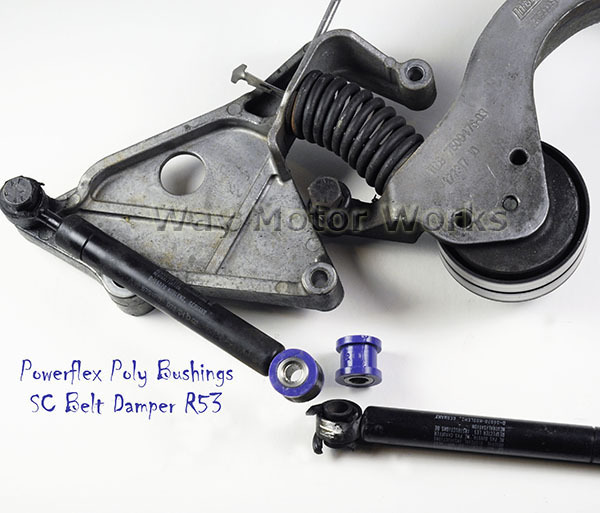 Powerflex Supercharger Belt Damper Polyurethane Bushing. This is a great addition for your MINI. With the stock damper over time the rubber bushings will wear out. When they wear out the tensioner can come apart and leave you stranded. Before this kit your only choice was to buy a complete tensioner at $180+. Replace them before it's too late. Look at the picture of this tensioner with shock, you'll see how the stock bushing came apart and the shock actually hit the crank pulley. Select the Add tensioner stop option to order a tensioner stop cable with your bushings. Since you already have the bolts out it doesn't take anything extra to install.